William Dicks was born in 1794 in Yeovil. On 19 April 1813, at the age of 19, he married 18-year-old Harriet Rawlins at Yeovil. They were to have at least 11 children between 1814 and 1837. He was first mentioned as a partner of glove manufacturers Dicks & Rawlins of Hendford in Pigot's Directory of 1830, the Rawlins part of the partnership was clearly to do with his wife's family, but the exact connection is not clear at this time. William was a member of the Vestry during the 1830s. By 1840, however, William was listed as a glove manufacturer of Hendford in his own right in the Somerset Gazette Directory of that year. In the 1841 census William was listed as living in Hendford with his wife, 10 of their children and a domestic servant. His house was only one of three in Hendford between Brunswick Street and the Dorchester Road. Both he and his 20-year-old son Henry listed their occupations as glove manufacturers. The 1851 census listed William and Harriet, together with five of their children, at their home in Hendford. William listed his occupation as 'Glove Manufacturer employing 30 men & 450 females'. His 24-year-old son William listed his occupation as a glover. Hunt & Co's Directory of 1850 again listed William as a glove manufacturer of Hendford, however two years later in Slater's Directory of 1852 he was listed as a glove manufacturer of Brunswick Street. The census of 1861 was much more helpful in locating William Dicks' property as by this time the railway hotel had been built at the bottom of Hendford Hill and William Dicks' property was listed immediately next door to it. By this time most of their children had left home and William and Harriet were living with just their unmarried son William, and the general servant. William gave his occupation as 'Glove Manufacturer (Leather) employing 16 men and 3 boys' while his son William was listed as a 'Glover (Leather)'. I was not able to trace William Dicks' death in the records but by 1871 Harriet was recorded as a 76-year-old widow living in high Street with her daughter Annie Manning and her family. It is unlikely that William's son, William Jnr, took over his father's glove manufacturing business as there are no further mention of glove manufacturers called Dicks after 1852. William Dicks' signature against the Vestry minutes of 3 March 1831. 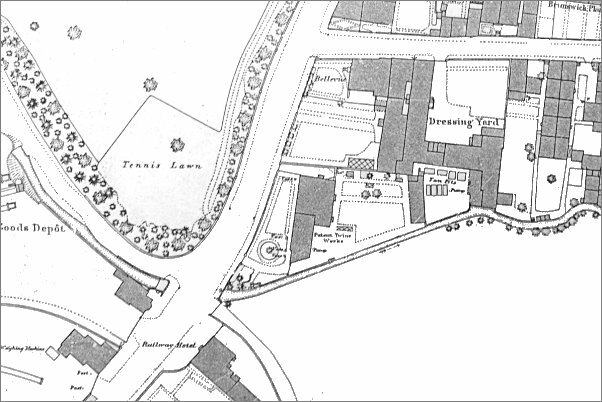 This map, based on the 1886 Ordnance Survey, shows Hendford running from top to bottom, Horsey Lane running off to the left and Brunswick Street at top right. The Railway Hotel is at bottom, left of centre. William Dicks' house was either 'Bellevue' on the corner of Hendford and Brunswick Street, or, more likely, the house at centre with the circular garden feature and the attached building which later became the 'Patent Twine Works'.